On Wednesday, Sweden ostentatiously inaugurated a test stretch of the world’s first electric road. Equipped with aerial contact lines from Siemens, the road is expected to supply electric hybrid trucks from Scania with renewable electricity in a costly bid to reach carbon neutrality. The colorful ceremony outside Sandviken was attended by Infrastructure Minister Anna Johansson, Energy Minister Ibrahim Baylan, Director General of the Swedish Transport Agency, Lena Erixon, and the Director General of the Swedish Energy Agency, Erik Brandsma. 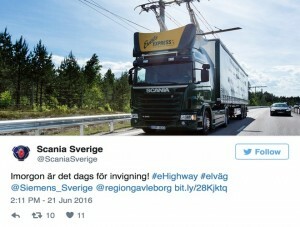 The tests will be administered for two years on a 22 km long stretch of the E16 road, which connects Norway’s Bergen and Oslo with Sweden’s Gävle north of Stockholm and is intended to provide electric power to heavy transports. Electric-powered trucks are expected to cut as much as 80-90 percent of fossil fuel emissions. “Fuelled with ‘good’ electricity, they are very environmentally friendly,” Magnus Ernström, project leader of Region Gävleborg told the Swedish trade newspaper Byggvärlden. The current from aerial conductors will be fed to the hybrid electric motor by means of a current collector or pantograph. The technology is not really new and is based on the 120-year-old tram technology. What makes it innovative is the hybrid technology that can “seamlessly” switch from powertrain to another, Magnus Ernström explained. At present, road transport accounts for one third of Sweden’s net carbon dioxide emissions, whereas heavy freight traffic has been particularly identified as one of the major pollutants. The tests will run until 2018 and are expected to provide knowledge of how electric roads work in practice, and whether the technology is viable. This experiment is part of the Swedish government’s efforts to target its goal of reaching a fossil fuel-free vehicle fleet by 2030. According to the Swedish Transport Agency, electric roads have the potential to achieve zero carbon dioxide emissions and contribute to developing smart and environmentally friendly means of transportation using the current road network. “If we were to supply the entire route from Borlänge to Gävle port with equipment and electric trucks, this would ensure the potential to completely reduce carbon dioxide emissions from heavy goods traffic. We are looking forward to using the data from this demonstration project to evaluate further investment,” Anders Bylund, business manager at Siemens, said, citing a huge interest from the Swedish industry. In addition to E16, Siemens is planning to take another demonstration route in use. The plan will be completed on a public road adjacent to the ports of Los Angeles and Long Beach in California, where Siemens is currently working together with Volvo Trucks and local actors in a demonstration project for the South Coast Air Quality Management District (SCAQMD).